openBVE v0.9.1.5 was released earlier today, along with a new demo route, which together expose openBVE's new animated object support for the first time. Now routes can truly be brought to life with dynamic scenery, working station clocks, departure boards, vehicles driving across road bridges, planes flying overhead, and anything else you can imagine. Head over to the openBVE homepage and give the new version a try along with DemoRoute1, keep your eyes open for a couple of surprises as you drive along the route, and have some fun with what will surely revolutionise the simulation experience for openBVE users. (Extract contents to "<System Drive>:/Program Files/mackoy/BVE4/" with the 'Use Folder Names' or equivalent option checked in your chosen file decompression utility). Note: I strongly recommend you take this opportunity to acquaint yourself with the 7-Zip (.7z) archive format and associated open source archiving utility (available from http://www.7-zip.org), and download the .7z version of the X-City South patch instead. As you can see, using 7-Zip allows me to offer much smaller archives thanks to the LZMA compression method used by this excellent utility (and which is incidentally also used by the NSIS based installers available from Rail Sim Routes UK). For those of you not too familiar with using archiving tools, I've prepared a simple step-by-step tutorial, which will help you to install the .7z version of the patch. If you are a new Cross-City South user, you can simply download the main Cross-City South v1.31.02 installer [14.0 MiB] which includes the above update already. If you only have the previous Cross-City v1.3 installed, prior to installing the main X-City South v1.31.02 installer, please delete your "<System Drive>:/Program Files/mackoy/BVE4/Railway/Object/Bham_X-City_South" and "<System Drive>:/Program Files/mackoy/BVE4/Railway/Sound/Bham_X-City_Sounds" folders first. 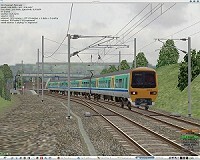 Please also visit www.trainsimcentral.co.uk to download the latest beta version of the Class 323 Unrefurb EMU for openBVE. Between around the 20th-24th October, my ISP experienced some e-mail problems which might have resulted in me not receiving some e-mails sent around that time. If you sent me an e-mail around then, and I haven't replied, please try sending it again, just in case I never received your message. Update (10th November 2008): The patches mentioned in this news item are no longer required, please see the more recent news item(s) for current openBVE updates. I missed a few errors in some objects; you can download this patch to solve possible errors reported by openBVE relating to SetColor commands (extract contents to "C:/Program Files/mackoy/BVE4/Railway/Object/"). If there are any other issues, please let me know and I'll fix them as soon as I can. Don't forget to install the main Cross-City South v1.31 download before installing the patch, and if you already have the previous Cross-City v1.3 installed, to delete the "<System Drive>:/Program Files/mackoy/BVE4/Railway/Object/Bham_X-City_South" and "<System Drive>:/Program Files/mackoy/BVE4/Railway/Sound/Bham_X-City_Sounds" folders before running the installer. I've also updated the cl323 openBVE update to fix further transparency issues (update removed as it's no longer required, please download the latest version of the class 323 from www.trainsimcentral.co.uk as usual). openBVE is currently in the early Beta stage, therefore isn't finished and isn't really intended for casual use yet, but even now it's potential is clear to see, and the features planned for the final release will extend it's capabilities beyond BVE 4's own. Advanced users or developers familiar with BVE add-on creation or software development and testing, may want to get involved with the openBVE project now, so add-ons can be made fully compatible by the time openBVE reaches the final release stage. The ongoing development of openBVE can be followed at Michelle's official openBVE Homepage: http://openbve.trainsimcentral.co.uk. Important Note: openBVE is under development, and is an early Beta release--the program is neither finished or feature complete yet! Regular users of BVE v2 or v4 who just want to start the program and run a route without a second thought, or those of you not so comfortable with more advanced computing tasks such as configuration file editing or add-on creation, should continue to use Mackoy's BVE, until openBVE reaches the final release stage in a few months time. In light of the progress being made with the openBVE project, and the stricter error checking performed by the program, I've updated the Birmingham Cross-City South with a variety of bug fixes which have gone undetected for some time. Those of you already using the Cross-City South in openBVE may have noticed some visual anomalies concerning some of the transparent textures, particularly where the old, pre-Cross City South v1.3 catenary is concerned; these visual problems were caused by incorrect transparent colours being specified in the objects (my fault! ), rather than any issue with openBVE's renderer. Any routes which also use these faulty objects will also exhibit this problem, for which I apologise (if you're a route developer and have used any of my objects, and encounter transparency problems in openBVE while using them, please contact me if you need assistance and I'll update the files for you). This update should resolve these problems in the Cross-City South route. You will however, still see some warnings relating to the parsing of train files; this is due to BVE 4's plugin DLLs not being fully supported (yet!). You will also have some issues with the sounds, especially the flange sounds--the Cross-City and/or 323 can be updated in future to take advantage of openBVE's differing flange sound handling techniques. Remaining issues will likely involve signalling and cab safety system functionality, along with certain features relating to .X format objects, all of which will be resolved with future openBVE releases and/or Cross-City South updates. I've also uploaded a temporary update for the BVE 4 Class 323 (unrefurbished) EMU, which adds objects for the external train view (based on Network West Midlands' 323 objects); these also include emissive head and tail lights to demonstrate the new extended CSV object commands related to lighting. The update also fixes a transparency problem with the cab. Update (10th November 2008): This update is no longer required; please visit www.trainsimcentral.co.uk to download the latest version of the Cl323 Unrefurbished EMU. I've also taken the decision to re-release the majority of files included in the Cross-City download (i.e. those files created by myself) under a copyright free, "Open Source" agreement. Some files need to remain under copyright, such as the New Street station announcement audio files I was granted permission to use; other objects, textures or sounds made by other developers remain under copyright too. These remaining copyrighted files are now stored in their own directories named "CopyrightMaterial", within the Cross-City's directory hierarchy, so there's no confusion about which files can be freely re-used and those which require permission before re-use. Oh yes. :) I've also updated the route files so they look for the class 323 EMU in the "Cl323 Unrefurb" folder, rather than the "cl323" folder (the 323's default installation folder was changed when the unit was updated with a fantastic wideview cab recently, over at Train Sim Central); this should stop any "Train not found" errors from appearing when loading Cross-City routes! Head over to the Birmingham Cross-City South Download page to get the latest version, remembering to delete your existing "<System Drive>:/Program Files/mackoy/BVE4/Railway/Object/Bham_X-City_South" and "<System Drive>:/Program Files/mackoy/BVE4/Railway/Sound/Bham_X-City_Sounds" folders prior to installation. Now for another update on the Watford Junction to Rugby project. :) Having seen the route run in openBVE with all details (except the 3D rail fasteners), at an average of around 8-20 frames per second on my own outdated AthlonXP 2400+, GeForce 6600GT 128MB, 1GB DDR-266 SDRAM system, it looks like the final route can retain much of it's detail and remain a pleasant experience on modern systems with far more capable CPUs and higher bandwidth DDR2/3 memory. For this reason, Watford Junction to Rugby is now being developed with openBVE in mind, first and foremost. BVE 4 and 2 versions will be released as well (see my 12th December update for details about how this will be done), but these versions will be a lower priority, and won't feature as much detail as the openBVE version. I'm pleased to say I've now completed another major feature of the route--Roade Cutting. 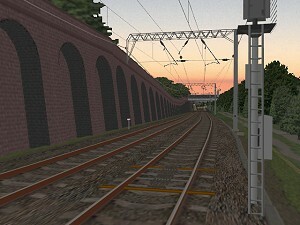 This unique and impressive feat of engineering is one of the most famous landmarks on the West Coast Main Line, and the simulated route features the distinctive retaining walls, bridges and girders found at the real location.
? Click the thumbnails on the left to see some new screenshots of Roade, or click here. I've also created some new, highly detailed 3D objects for use with openBVE's external views. These new objects include far more polygons than my previous efforts (apart from the class 66 for BVE v1 which I created years ago! ), include rounded roof sections that look good from any angle, and use higher resolution, mostly photo-based textures. The new objects currently include class 86/AL6 and class 87, as well as Mk2 and Mk1 coaches. I'm working on a class 85/AL5 too, and I'll post some screenshots once it's finished.
? Click the thumbnails on the left to see some screenshots of the new train objects, or click here. I've also prepared another video preview to demonstrate the route in openBVE, and to show openBVE's external camera views. This video is over 9 minutes long, and features sections of the 'Maximum Detail' route between Watford and Rugby, as my last video did, but with a variety of camera angles and eras. These downloads are hosted on popular ad-supported one-click hosting sites due to their large size; you may need to wait 45 seconds for the download link to become available, and you don't need to subscribe to anything in order to download them; free downloads are available. I also don't know what adverts will appear on the download pages (if any); visit at your own discretion. This is a large download (98.4 MiB or 55.2 MiB depending on resolution). The video has been compressed with the Xvid codec; you'll need a decent video player capable of viewing Xvid encoded AVIs--you can use your existing media player software and install the open source Xvid codec, or you can use a player like the free VideoLAN Player. This video can also be viewed via YouTube (standard and high quality versions available). Downloadable versions are hosted on ad-supported one-click hosting sites due to the file size and bandwidth requirements. Additional Note: The route is still under development, and contains some innaccuracies; the 'master route file' from which all other route variations will be derived, contains objects which are intended for both the present day route, and the route as it was in earlier years. While capturing the video I removed a lot of the objects which should only appear in a particular era, but a few remain. The AL1 and Class 81 objects featured in this video were made by Oskari Saarekas, with modifications by myself. Just a quick update on my progress with the Watford Junction to Rugby route. I'm please to say that one of the problems which has prevented me from making more rapid progress with the route, namely finding a way to easily reduce the detail level within the route, has been solved. One of the main reasons I haven't been able to get sufficiently good performance out of the route, is due to me placing far too many individual 3D objects along the route, which BVE 4 wasn't able to handle too well. Thanks to Daniel Beardsmore over at Telcontar.net, I now have a handy utility called Batch-RegEx (which Daniel kindly updated for me), which allows me to perform multiple regular expression search and replace operations across multiple files, in a single batch operation, which means I can create scripts which automatically strip out object indices and any references to those objects within my route files. Consequently, this allows me to more easily create route files with different detail levels, as I can automatically create stripped down route files whenever I like, while actual development need only take place on a single "master" route file which contains all the details and features. With previous routes, once I'd created the different detail levels, I had to edit those numerous files simultaneously if I wanted to add features or correct mistakes in the project, which was time consuming. This will also speed up future Cross-City route file creation as well. I've updated the Birmingham Cross-City South installers (again! ), however I've made no changes to the route itself--so if you already have the route, you don't need to download anything again. The Cross-City South is now available in a single 14 MB download (replacing the 4 seperate downloads totalling 24 MB previously), and is packaged using the excellent Nullsoft Scriptable Install System (NSIS). This should make installation easier, and the new Setup routine allows you to choose whether you wish to use the route with BVE 4 or BVE 2.6, and automatically changes your installation directory accordingly. I've made some progress with Watford Junction to Rugby recently, and thought I'd share some new screenshots and a video preview to demonstrate the progress of the route. Most of the scenery on the route is now completed (a couple of areas excepted), and most of the detailing is also complete on the present day version. I (still!) haven't gotten around to updating the station buildings on the route, which is why station areas don't appear in any of the images yet. I've also decided to put on-hold the Northampton Loop, and also the 60's 'Electric Blue' era routes, and focus on the more recent versions exclusively, to make the project more manageable. I've done some experiments with the route and I think I'm getting closer to striking a balance between visual effect and performance. The first few images on the screenshots page show how I think the final, drivable BVE route will now look (i.e. the 'High Detail' version, roughly equivalent to the detail level of the same name in Cross-City South v1.3). The remaining new screenshots show the 'Maximum Detail' route, which instead shows the level of detail that I'm capable of modelling, rather than what BVE is capable of handling; but maybe one day some of that extra detail can be introduced into the regular BVE route, as computer technology advances. Visit the Screenshots tab in the Watford Junction to Rugby section of the site to see more. The video preview is over 7 minutes long, and features sections of the 'Maximum Detail' route (sans 3D track) between Watford and Rugby. The video was made using the Track Viewer utility rather than BVE itself (due to performance issues and my development PC being a bit behind the times), and some automated macros were used to make an unattended batch capture of the images, and VirtualDub was used to rapidly compile them into video. The video is not a demonstration of BVE per se, but of my modelling abilities; however I expect the final route to look similar to what is depicted in the video, minus many of the small lineside details. This is a large download (55MB or 79MB depending on quality), recommended for broadband users only (or dial-up users with amazing patience!). The video is MPEG-4 encoded; you'll need a decent video player capable of viewing MP4 files--I recommend the popular, free VideoLAN Player. This video is hosted on ad-supported one-click hosting sites due to the file size and bandwidth requirements; a YouTube version is also available. Additional Note: The route as shown may contain some minor innaccuracies; the 'master route file' from which all other route variations will be derived, contains objects which are intended for both the present day route, and the route as it was in earlier years (incidentally, another reason performance is low! ); I've removed a lot of the objects which should only appear in pre-2003 route files, but a few remain. If you use Windows Vista, and have playback problems, go to VideoLAN Player's 'Settings' Menu, select 'Preferences', expand the 'Video' node, click 'Output modules', and tick the 'Advanced options' checkbox in the bottom-right of the dialog; a 'Video output module' dropdown list appears--select 'Windows GDI video output' from the list, and click OK.
As new users of Windows Vista will be aware, BVE 4 isn't supported in Vista, due to the latter's support for DirectX 9 and 10 only; BVE needs DirectX 8 in order to work. However, if you visit this this thread on the RailUK Forums, you can find some instructions explaining how BVE 4 can be made to work under Vista. Some users experienced problems, however others; myself included, have been able to run BVE 4 on Vista, with just a couple of minor issues that don't detract much from enjoyment. I've also updated my BVE Help and Information Guide to bring it up-to-date. Quite a number of people seem to be having problems with 'Train not found' errors when trying to use the BVE 4 version of Cross-City South. This is because, in order to maintain backwards compatibility with BVE 2.6, the default installation path used by the Cross-City South installers is 'C:/Program Files/BVE/', but the class 323 EMU now installs by default to 'C:/Program Files/mackoy/BVE4/', and if the route and train are installed in different locations, the route won't work. At the time of Cross-City South's release, the 323 installed to 'C:/Program Files/BVE/' by default. While BVE 2.6 is a great piece of software, it also has fewer users now, so for the sake of convenience I've udpated all the Cross-City South installers to install to BVE 4's directory by default, and the BVE 2 routes are now available as a seperate add-on, so BVE 4 users don't need to have route files installed which they don't need. If you want to use Cross-City South with BVE 2.6, you'll need to tell the installers to extract files to 'C:/Program Files/BVE/' manually, and then install the BVE 2 route/activity add-on. Visit the newly reformatted Cross-City South Downloads section, and scroll down for the updated installers. A BVE user kindly alerted me to some ommisions from the Cross-City South/Class 323 Tutorial, in the Driver's Guide for BVE section of the site. In the step-by-step section, I seemingly forgot to include instructions for turning off the Driver's Reminder Appliance (DRA), and moving the reverser to the correct position, prior to departing Redditch. Of course, following the steps as they were, resulted in a train that refused to move when power was applied! I'm sorry for the frustration some users might have felt because of these ommissions, and the tutorial has now been amended. Oops! I've finally updated the Links page to correct the URLs of sites which have moved during the last couple of years, and removed a number of dead links as well, so hopefully the Links page will be more useful now. I've also added a few new sites to the list. In order to reduce page loading and rendering times, I've also removed most of the banners, and used text links instead, which will also be easier and quicker to update. If you previously had a link on the Links page, and it's now missing, but your site is still active, please contact me and I'll re-instate it. I've uploaded two galleries of Watford Junction to Rugby screenshots, and also uploaded a new gallery of photos covering the real line; you can see them all via the new Rail Sim Routes UK Gallery page. I should point out that these screenshots feature the 'Maximum Detail' routes, which are primarily designed to see just how much detail can be built into a route, and as such the 'maximum detail' routes include more detail than BVE can adequately cope with at the moment, and the high resolution textures also place too many demands on BVE. Therefore the final route will be closer to Cross-City South v1.3 in terms of visual quality, but with lower resolution versions of the photographic textures shown in these screenshots, and fewer, more simple lineside details. The overall appearance of the final route will be similar however. While the Watford Junction to Rugby project has received most of my attention, I have made some progress with the Cross-City North recently as well. I'm pleased to announce that I've successfully merged both Cross-City South v1.3 and Cross-City North into a single route, so, provided BVE (v4) can cope with the extra demands of handling the additional Cross-City North objects, textures and larger route files, it should be possible to drive the 323 all the way from Redditch to Lichfield Trent Valley without having to interrupt your journey. Naturally Cross-City North has been automatically upgraded to Cross-City South v1.3 standards as it shares many of the same objects, and I'll upload some new screenshots of Birmingham New Street to Lichfield Trent Valley as soon as I'm happy with the results. These new screenshots will also give an indication of the level of detail to expect in the final Watford Junction to Rugby route as well. I'd like to thank everyone who has commented on the new Cross-City South v1.3 on various forums since it's release, and also those who have contacted me and let me know what they think of the new route--all of your feedback is greatly appreciated! The latest version of BVE (version 4.2) was released by Mackoy earlier this year, and I have (finally!) updated my BVE Help Guide to reflect the changes to Mackoy's website along with BVE v4 installation instructions, although the guide to downloading and installing BVE 2.6.3 remains available too. Cross-City South v1.2 wasn't completely compatible with BVE v4.x, so I've released a significant BVE 4 update for the route to bring the Cross-City South to version 1.3. The Cross-City South now makes full use of BVE v4's new features, and includes new Autumn 2004 and Spring 2005 routes. BVE v2.x users get two new 'High Detail' Spring 2005 routes minus the BVE v4 specific functionality, and all BVE v2 compatible routes benefit from some cosmetic upgrades. The BVE 4 class 323 EMU by Steve Green, Simon Gathercole and myself has also been updated with a set of new features thanks to Simon and Steve's work with the plugin DLL, and the unit has also been updated with some of my own new authentic Cross-City flange sounds, plus my own updated 16-bit run sounds, for use with Cross-City South v1.3. I have also upgraded the Class 323 Passenger Views for BVE 4, and these now include 1024x768 passenger view panels and updated 16-bit run and flange sounds. Full BVE v4.2 compatibility when used in conjunction with the updated BVE v4 class 323 EMU by Steve Green, Simon Gathercole and myself, or indeed the updated Class 323 Passenger Views for BVE 4. Route modifications to allow the use of the class 323's fully working Automatic Warning System (AWS) and Train Protection and Warning System (TPWS), plus new raindrop effects. The 323 also includes other features such as a fully functional Vigilance Device, Driver's Reminder Appliance (DRA), Power, Brake and Door Interlocks, Pantograph Up/Down functionality, and accurate guards buzzer. These features are possible thanks to BVE v4's new method of handling signalling and train safety systems, together with Simon Gathercole's superb plugin DLL for the class 323 EMU. New Dawn, Sunset and Night* routes, using realistic time of day lighting effects thanks to BVE 4's new Directional and Ambient Lighting features. Many objects in these routes also use the emissive colour properties of DirectX (.X) objects, which allow faces to be illuminated independently of the ambient lighting conditions, which in turn allows glowing lamps, street lights and headlights. Many thanks once again to Simon Gathercole for his assistance with pointing out and explaning the emissive colour and specular properties of DirectX objects. New Autumn 2004 and Spring 2005 routes. The Autumn 2004 routes use a pair of class 323 units on a busy morning rush hour service from Redditch to Birmingham New Street, with the special Cross-City 'leaf fall' timetable. Visibility is reduced, and the 323's new raindrop effects and wipers can be seen. The Spring 2005 routes feature a late morning run into New Street, in either cloudy but dry conditions, or wet and thundery conditions. Birmingham New Street's new bay platform 4c is also modelled, along with small differences at the lineside, and the new pointwork installed recently at Longbridge and Kings Norton is represented. The MkI and MkIII catenary systems are now photo-realistic, with registration arms, support tubes and insulators all derived from photographs. Masts, headspans and portal structures are now modelled in true 3D, with additional details such as new mast ID plates, and other mast mounted signs and labels. New prototypical cantilevers are also installed in certain tunnels on the approach to New Street. The new enhanced catenary draws upon work done while developing the Watford Junction to Rugby project. Additional lineside signs have been added, such as Sandite markers; and other lineside details are more accurate. All platforms have been upgraded with new higher resolution and photo-realistic textures, along with additional refinements such as smoothly curved platforms at Barnt Green and University. New track textures have been added, improving the appearance of the route. All routes have randomised signalling--you can get anything from a clear run in to New Street, to signal checks all the way from Longbridge. * One of the new night routes is experimental, and designed as a demonstration of BVE v4's ability to render true night time with proper illuminated objects, and without the need for special darkened scenery or the use of 'black fog'. Unfortunately BVE v4.2 doesn't illuminate the cab independently of the external lighting level, leading to a dark cab, and neither does BVE simulate a headlight. Only use this experimental route if you're interested in seeing a more realistic depiction of night within BVE, but less fussed about seeing the cab gauges! ** The BVE v4 class 323 has been updated for full compatibility with Cross-City South v1.3. If you don't download the new version, it will work but you won't hear the correct flange sounds, and those you do hear may not sound too good in places. This is because the original sounds I included in the 323 were designed for BVE v2, but flange sounds are handled differently (and better in my view) in BVE v4, and needed to be updated accordingly. Note: BVE v4 no longer uses the information 'markers' which gave BVE 2.6 users of the Cross-City South such information as upcoming speed restrictions, landmarks and location names. BVE v4 provides no equivalent facility to display this information, therefore I've included some of it on BVE 4's pop-up timetables instead. The route information on the timetable display is automatically updated at each station stop, and you can manually display this information between stations if you like. The experimental night route, designed as a demonstration of BVE v4's ability to render true night time with proper illuminated objects, and without the need for special darkened scenery or the use of 'black fog'. Unfortunately the 323's cab is displayed as dark as the scenery so this route is for novelty value only! The new Dawn routes for BVE v4, which use BVE 4's ambient and directional lighting capabilities to recreate more atmospheric lighting effects. Also note the new photo-realistic MkIII catenary and 3D gantry. The amazing new class 37 for BVE v4 has just been released over at www.trainsimcentral.co.uk, and Cross-City South v1.3 includes bonus activities which use this fantastic new loco. Route files are also included which use the BVE v4 class 158. These bonus routes make use of the new features included in both trains. The class 37 activity is in the form of a railtour from Redditch as far as Birmingham New Street, up the fast lines between Longbridge and Kings Norton. The class 158 activity is a run from Barnt Green to Birmingham New Street, also via the fast lines. 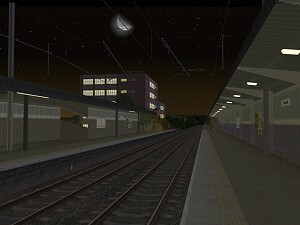 These alternative path variations were created using Oskari Saarekas' BVE Route Randomiser (BRR), available here: http://koti.mbnet.fi/~lopomo/trainsoft/index.html. Please be sure to read the documentation included in both the new class 37 and the 158 to get the best out of both trains, and remember to turn your speaker volume up while thrashing the 37!! For BVE v2.x users, two new Spring 2005 routes are provided, minus some of the BVE v4 specific features. These new route files benefit from the new photo-realistic platform textures, the new photo-realisitic 3D catenary system, the new track textures, and updated lineside signs, scenery and renewed trackwork at Longbridge and Kings Norton. If you need help with obtaining BVE v4.2, please read my updated BVE Help Guide. If you use Windows XP, then using BVE v4 wil be straightforward. However please note that if you still use Windows 98, you may need to install Japanese Language Support if BVE v4 fails to run correctly. Japanese Language Support can be obtained via Windows Update, or failing this, by opening Internet Explorer, going to the 'View' > 'Encoding' > 'More' submenu and selecting 'Japanese (Auto-Select)' --Internet Explorer should prompt you to install Japanese Language Support, and BVE v4 should then run after this is installed. Cross-City South v1.3 is available as a completely new set of downloads for BVE v2 and v4 users. I'm afraid a patch to update Cross-City South v1.2 to v1.3 is not available--so many files have been updated or relocated that the update would have been a large download in itself, so existing Cross-City South v1.2 users will have to download the route again. Head over to the updated Birmingham Cross-City South v1.3 section of the site, where you'll find the downloads, and a restructured Route Information section.